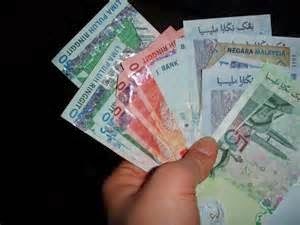 Malaysia’s ringgit reached a five- month high and the benchmark stock index climbed to a record after the nation’s economic growth and current-account surplus beat forecasts. GDP rose 6.2% in Q1 from a year earlier, exceeding the 5.7% expected by economists in a Bloomberg News survey and marking the fastest pace since the period ended December 2012, after markets closed on May 16. The data added to speculation that Bank Negara will raise borrowing costs for the first time since 2011 to temper the quickest inflation in almost three years. The ringgit rallied 0.7%, the biggest gain in a month, to 3.2108 per dollar in Kuala Lumpur, according to data compiled by Bloomberg. It reached 3.2078, the highest level since December 11. The FTSE Bursa Malaysia KLCI Index of shares climbed 0.2% to 1,887.07, while bonds maturing in three, five and 10 years dropped. The current-account surplus, the broadest measurement of trade, widened to RM19.8 billion (US$6.2 billion) in the quarter, above the median estimate of RM16.6 billion.. A May 8 central bank statement issued after a decision to keep interest rates unchanged said “the degree of monetary accommodation may need to be adjusted” to address the buildup in economic and financial imbalances. Growth in the first quarter was “exceptional,” and the expansion in subsequent periods was expected to be about 5% to 5.5%, central bank Governor Tan Sri Dr Zeti Akhtar Aziz told reporters in Kuala Lumpur on May 16. Accelerating price pressures and concerns of financial imbalances are likely to prompt the monetary authority to begin tightening policy with a 25 basis point increase in the third quarter, Australia & New Zealand Banking Group Ltd. economists including Singapore-based Glenn Maguire wrote in a May 16 report. The next central bank meeting is due on July 10, 2014. A government report on May 21 may show consumer-price gains held at 3.5 per cent in April, a Bloomberg survey shows, matching the pace in the previous two months that was the fastest since June 2011. Global funds increased holdings of Malaysian equities by RM656.8 million in the five days ended May 16, the third highest weekly increase this year, Zulkifli Hamzah, an analyst at MIDF Amanah Investment Bank Bhd in Kuala Lumpur, wrote in a report, citing stock-exchange data.